They are all suitable aquarium species as long as their needs are fulfilled and they are placed with suitable aquarium companions, or by them selves. Unfortunately a lot of ignorant aquarists buy small Parachromis fish for their aquarium without realising that this fish will grow much larger, and that it is a capable predator that should not be kept with smaller fish. Parachromis reputation as a vicious killer machine and impossible to keep in aquariums is greatly undeserved. They are fascinating aquarium fishes, but will require a large aquarium since they grow very large. As long as you understand the natural behaviour of the Parachromis species and provide them with suitable conditions, they are very rewarding fishes to keep. You can even house them with other cichlids as long as those cichlids are large enough and capable of fending for them selves. Comparatively timid species should not be kept with Parachromis, since the timid fishes will become harassed and stressed. The aquarium should always be decorated in a way that forms natural borders and include a lot of hiding places. If the aquarium is large enough and decorated in a way that makes it possible for each individual fish to claim its own territory and stay out of the others way, there will be a lot less fighting and aggressive behaviour among the inhabitants. As mentioned above, a large aquarium is imperative to successful Parachromis keeping. A 540 L / 120 gallon aquarium is an absolute minimum. The largest Parachromis species, the Parachromis dovii, can grow longer than 28 inches (70 cm), and will need an aquarium that is larger than 540 L / 120 gallon. This species is actually much more suitable as a pond fish than as an aquarium fish. Once you have found a large enough aquarium and suitable companions, the Parachromis is very easy to care for. It will survive in most water conditions and is easy to feed since it accepts a wide range of foods. 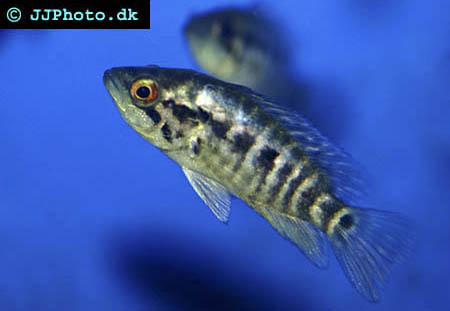 Pellets will provide a good base, and should be supplemented with a variation of fish, shrimps and similar meaty foods. Feed your Parachromis a few times a day, and let it occasionally go without food for 2-3 days. When you create the natural territories in the aquarium it is recommendable to use rocks and bog wood. The aquarium must be divided into several sections, without a clear line of sight from one section to the other. The Parachromis is much less aggressive in an aquarium where it can lurk in its own territory and stay away from fights. Hiding places must also be created, since weaker fish will become very stressed if they have nowhere to hide. Parachromis is a prodigious digger, which means that the rocks must be placed directly on the bottom of the aquarium and not on the substrate. If a large rock is placed on the substrate and undermined by the Parachromis, the rock can fall down and cause cracks and leaks in the glass. The Parachromis species are extra found of digging during the spawning period.